So this is a big week... it is the last week of school, not just for the semester, but for undergrad. Next week is graduation. Then I have to pack up all of my things and move to LA for a BCBG internship. I am excited. But also sad to leave my amazing instructors and mentors as well as my design friends that will also be heading off to internships and jobs in the next few weeks. 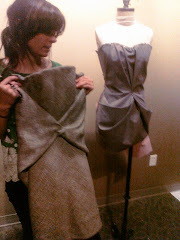 Thank you to Amy, our fit model, and to Jackie Nguyen for the technical design. Congratulations to Jackie for her internship at Nice Collective this summer. They have some nice "process" pictures on their website that I would encourage you to look at. Congrats on finishing undergrad and best wishes on your internship in the big city.